Off the grid doesn't have to mean out of luck. AIR small wind turbines allow you to harness nature’s energy to power your day-to-day needs practically anywhere on Earth with sustained winds. The best-selling small wind generators in the world, AIR turbines are ideal for RVs, remote cabins and hybrid systems. For sailboats and offshore platforms, please click here. Combining wind power with solar is ideal for helping you meet your energy needs. In general, cloudy days tend to produce more wind and calm days more sun, so combining the two creates a perfect complementary system for keeping your batteries charged. AIR systems are ideal wind turbines for hybrid systems with solar to offset those cloudy or wintery periods. 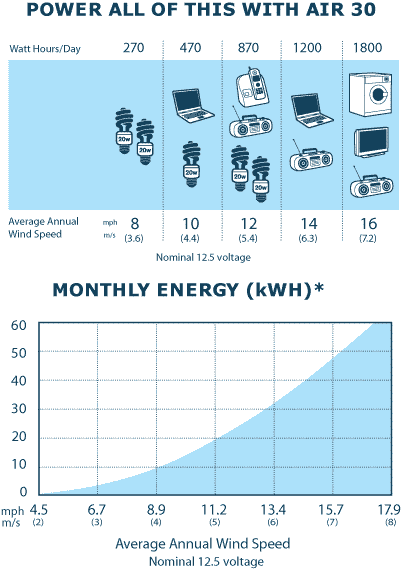 Choose from 12, 24 and 48 Volts models according to your energy needs. AIR 30 is the best choice for small battery-charging applications such as small cabins, RVs, camping, garden lighting and hobbies. AIR 30’s optimized software delivers reliable energy. Extensive third party testing and certification shows more consistent output than the competition. AIR 30 is part of the latest generation of AIR products—the world’s best-selling wind turbines—with more than 135,000 units sold worldwide. For a larger system, please click here.